Connor does not see himself as a grand explorer, just some guy from Axbridge who has a love of spending time in the underground world, often in completely flooded passages. Originally from Scotland, he spent most of his adolescence in the mountains. In his early 20s he discovered an intense love affair with caving, more specifically diving in flooded passages using scuba equipment, unable even to see his hand in front of his face. Connor has participated in and led expeditions to Spain, France, Slovenia and Mexico. He is one of the few people who has had the privilege to say that he has truly gone ‘where no man has gone before’; whether under the Mendip Hills of Somerset or in remote caves in Mexico. In 2017 he found himself as the youngest member of a small team of cave explorers aiming to unlock the secrets of the Huautla Mountains in Mexico, an experience that has led him to be the youngest exploration diver on ‘The Return to Pena Colorada’ in 2018. 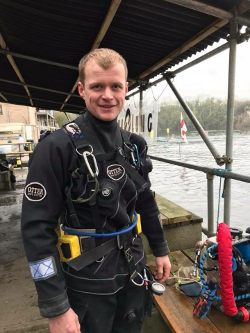 Connor was one the the British cave divers flown out to assist with the Thai cave rescue in July 2018. 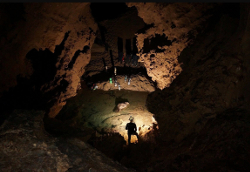 During the Spring of 2018, an international team of cave explorers set out to tackle a remote cave in Southern Mexico, Cueva Pena Colorada. Due to the logistical complexity of its exploration, this spectacular cave has seen less than a handful of visits since the region started to attract cavers. The team’s primary objective was to place a series of exploration divers in the cave's final sump, something that has not been done since 1984 when the exploration involved Bristol’s Rob Parker, the late founder of the Bristol Climbing Centre. Back then, divers lack ed the advanced equipment that is available to us today and with the aid of modern diving equipment and techniques, the team connected this vast cave to the extensive Huautla system on the mountain above. With a 4km gap between the two systems, making the connection between these two magnificent caves was not an easy feat. Hi, thought this Lecture may be of interest http://www.wildernesslectures.com/speaker.php?id=237 ----------------------------- During the Spring of 2018, an international team of cave explorers set out to tackle a remote cave in Southern Mexico, Cueva Pena Colorada. Due to the logistical complexity of its exploration, this spectacular cave has seen less than a handful of visits since the region started to attract cavers. The team’s primary objective was to place a series of exploration divers in the cave's final sump, something that has not been done since 1984 when the exploration involved Bristol’s Rob Parker, the late founder of the Bristol Climbing Centre. Back then, divers lack ed the advanced equipment that is available to us today and with the aid of modern diving equipment and techniques, the team connected this vast cave to the extensive Huautla system on the mountain above. With a 4km gap between the two systems, making the connection between these two magnificent caves was not an easy feat.